Durham Ltd provides disposable packaging solutions for foodservice establishments, catering companies, and wholesale distributors. Choosing the right disposable packaging is an important decision for food service professionals. In fact, 70% of QSR orders are consumed off premise and one of every three consumers places at least one catering type food order every month! Durham Ltd To Go and food delivery packaging options include: insulated beverage containers, soup containers, pizza boxes, hoagie containers & hot dog containers, sandwich containers, paper towel, napkin and tissue products, drinking cups, disposable soup tureens, food utensils, and more. This plastic, recyclable ladle is tall, narrow and deep. It’s a 2 oz. ladle that is truly 2 ozs. 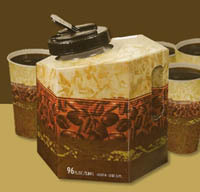 Increase your coffee or beverage sales with the 96 oz Coffee Carrier or Insulated Beverage Containers. 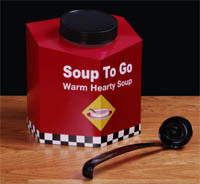 Add higher profit sales to your ordinary lunch or take out orders by offering Soup To Go in a disposable soup tureen. Clear plastic hinged Hot dog containers, clear hoagie containers, & sub containers that are ideal for deli containers and more. Custom pizza or clamshell boxes with a window. Increase your sales with our pizza boxes and promote your business via custom pizza box packaging. Clear hinged sandwich containers or wrap boxes are great for deli's to show off their food . Our full line of paper products can meet all your foodservice and supply needs. Full line of food service supplies including utensils, straws, and stirrers. Don't see what you are looking for ?? Please Contact Us We will design and supply it for you! Building better disposable packaging and carriers for the coffee house, catering, and convenience store industries is our business.